This excerpt is from my new book, E-X-I-T-O: Su estrategia de marketing digital en 5 pasos. In English, that is – E-X-I-T-O: Your Digital Marketing Strategy in 5 Steps. Click on these links to read the first excerpt, second excerpt, and third excerpt. In his book Banker to the Poor, Muhammad Yunus tells his story of how he established the concepts of microcredit and microfinance. While serving as the head of the Economics department at Chittagong University in Bangladesh, a severe famine broke out in 1974. This contradiction perplexed him: how could he teach such a sophisticated level of economics while at the same time his fellow countrymen were starving to death on the streets? Clearly, the country’s economic system needed to break the cycle of poverty in order to fix itself. He established a rural research project to observe how the economy of the poorest Bangladeshis functioned. From there, he developed a lending system to foster poverty reduction where groups of (mostly) women borrowed money as a means of support and accountability to one another. If we consider this story from the perspective of our E-X-I-T-O process, we see that he not only observed and listened to what his fellow countrymen needed, as we outline in the first step of the process, but he also “put himself in the shoes of the user” or customer, as we outline in step number two. This was the process that Muhammad Yunus went through to establish his new concept of “microfinance.” Yunus won the 2006 Nobel Peace Prize for founding the Grameen Bank, now the Grameen Foundation, which implemented his concepts of “microfinance.” Subsequently, the bank has successfully loaned its customers over $12 Billion USD cumulatively since its inception with a nearly 97% rate of recovery, or re-payment rate. What makes Grameen especially interesting is the average loan size relative to the bank’s holdings. Its average loan equals $143 USD per member whereas the banked held $1.7 Billion USD in total assets as of 2010. This presents a new business opportunity for Latin America’s digital marketers in the financial, cell phone services, computer hardware, and Internet news and information industries. Even if your company makes very little from each customer, the opportunity to scale a product with a low-income population represents a billion dollar business opportunity. 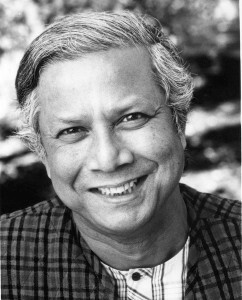 Not only did Yunus put himself in the shoes of the user to develop the highly successful Grameen Bank. He also encourages video-conferencing, in the above quote, as a means of involving the customer into the product/service development process. One organization that is developing this “Aladdin’s Lamp” or new technology products for low-income consumers is One Laptop Per Child. The non-profit aims “to create educational opportunities for the world’s poorest children by providing each child with a rugged, low-cost, low-power, connected laptop with content and software designed for collaborative, joyful, self-empowered learning,” according to its mission statement. OLPC’s product, the XO Laptop, evolved out of the educational research of Seymour Papert, an MIT mathematician, computer scientist, and a founding faculty member of the MIT Media Lab. Since the 1960’s, he has promoted the idea of children using computers as instruments for learning and for enhancing creativity. The XO laptops ingeniously incorporate the target users’ needs. Their rugged, drop-resistant design utilizes very little power (2 Watts vs 20-40 watts for regular laptops) from solar panels oftentimes in locations where electrical connectivity is not available. The screens can be viewed in broad daylight, specifically made for schools with outdoor classrooms. The XO’s devices come pre-installed with a variety of educational applications, designed to appeal to the naturally inquisitive nature of children. 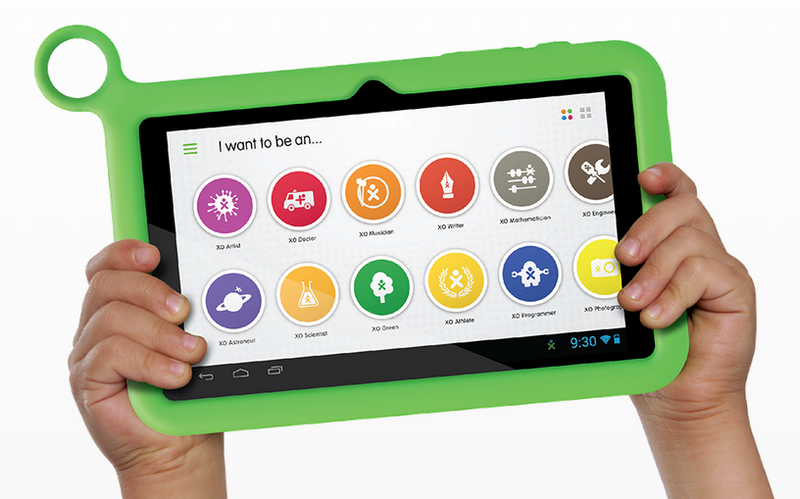 Today, One Laptop Per Child has transitioned to the age of tablets and the Android operating system with its XO Tablet. To learn more about One Laptop Per Child, watch this video documentary by Michael Kleiman, “Web: The Film,” about how the remote Peruvian village of Palestina got connected connected to the Internet. And read the article on the New York Times’ website here. 100% of the author proceeds from E-X-I-T-O will go towards the non-profit One Laptop Per Child, which offers laptops, tablets, and educational software to children from low-income communities in Latin America.